At a time when female foeticide has assumed alarming proportions in the state, particularly in the districts of Jammu, Kathua and Udhampur, the Central Reserve Police Force (CRPF) has launched project “Janani” for the welfare and education of girl child of its troopers. With the announcement of this year's Padma Shri awards to Prof Hamidi Kashmiri, Dr Jatindra Udhampuri and Ghulam Mohd Mir, the prominent personalities from Jammu and Kashmir figuring in the list has gone to 35. The Sher-e-Kashmir University for Agricultural Sciences and Technology (SKUAST) Jammu claimed that it had successfully cultivated kala zeera in the Padder valley of Kishtwar district. Though the administration has penalised many for smoking in public places, people continue to flout the law. People can be seen openly violating the ban on smoking at many places. Weavers follow a script (taleem) being read out loud and clear by the master craftsman while weaving a carpet on looms. The valley of Kashmir is known for its natural beauty and to add to the pristine glory of the valley, the Srinagar Municipal Corporation (SMC) has taken measures to beautify the city by constructing fountains at various places across the city. Five years have passed since a container depot was sanctioned for the Kashmir valley, but the same is yet to see light of the day. Traders and exporters argue that the depot would help save time, repackaging and handling losses, which put additional burden on their pockets. Finally, the Border Roads Organisation (BRO) woke up to the long-pending need to revamp the accident-prone bumpy stretch of Chenani to Dogra on Jammu-Srinagar National Highway. The culture-conscious people of the city have reasons to cheer as the “Heritage Point” on both sides across the Hotel Asia road is being decked up with the paintings depicting the multi-cultural face of the state. Criminals have principles, so it is said. But this doesn’t seem to be true anymore. One class of these anti-social persons-the pickpockets-have spread the menace everywhere. Be it temples, hospitals, bazaars, railway stations or bus stands, pickpockets are all around us. For the past four and a half years, the first drive-in tourist reception centre known as “Gateway of Kashmir” is coming up at cost of Rs 3.65 crore on the Srinagar-Jammu National Highway at Qazigund, 74 km from Srinagar. Under the project, the CRPF will open bank accounts of newborn female children with initial deposit of Rs 500. The project was launched by Narendra Paul, Commandant 166 Battalion, at a function at Bari Brahmana. Social activist and educationist Prof Rita Jitender and a large number of families of CRPF troops were present. Commandant Paul said the project would be implemented in all CRPF battalions, units and sub-units in the state. “Every child, born after January 1, 2009, will be covered under the project wherein the CRPF will contribute Rs 500 and open their accounts”. The CRPF personnel would be asked to contribute further to the account of their children, he stated. About 18 families were handed over passbooks of accounts opened with Punjab National Bank on the occasion. Paul said the scheme had been launched through the CRPF Wives Welfare Association (CWWA) which would implement the project at every unit and sub-unit throughout the state. He pointed out that the project was launched on December 18, 2009, by Union Home Minister P Chidambaram in Delhi, following which the project was being implemented in all states. “The project is aimed at encouraging the families of the CRPF personnel for giving proper education to their daughters and striving for their overall development without any discrimination”. Emphasising on the need to end discrimination towards the female child, Rita Jitender said it was unfortunate that even today girls were being ignored by their parents in every aspect, including proper bringing up and education. She also stressed upon the need to launch a campaign against foeticide and discrimination against women. Out of the total awardees, only seven women from the state have so far been bestowed with Padam Shri, which was instituted in 1954. Mrs. Mali was the first woman from J&K to get Padma Shri for social work in 1972. In 2006, Dr Tsering Landol became the first Ladakhi women to get this award in the field of medicine. Noted Kashmiri singers Raj Begum and Shamima Dev Azad, Dr Mehmooda Ali Shah, Begum Zafar Ali and Maryam Begum are the other women from the state who have been bestowed with Padma Shri. While none Jammu and Kashmir could get the Padma awards from 1954 to 1960, Sonam Narboo was, in fact, the first state subject to receive it for civil services in 1961. Again, from 1992 to 1997, there was no Padma Shri recipient from J&K. The year 1974 will be remembered for all times to come as four eminent personalities from the state were bestowed with Padam Shri. Of them, three were artistes of Radio Kashmir, Srinagar's most popular family serial programme 'Zoona Dab', based on public grievances. The three radio characters were Pushkar Bhan as 'Mama', Som Nath Sadhu as 'Agha Saheb' and Mariam Begum as 'Agha Bhai'. The fourth Padma Shri recipient in 1974 was Ghulam Qadir Lala for his distinguished services in trade and industry. Social worker Mohd. Din Jagir was awarded Padma Shri in 1966 whereas Akhtar Mohideen got the award in the category of literature and education in 1968. Noted Kashmir based doctors-- Ali Jan and Naseer Ahmad Shah--were conferred with Padma Shri in the field of medicine in 1975 and 1984, respectively while veteran journalist Mulakh Raj Saraf was given the award in 1976. Noted historian and litterateur Moti Lal Saqi was awarded Padma Shree in the field of Literature and Education in 1989 while's Prof Ram Nath Shastri, the doyen of Dogri literature, got the award in 1990. Gyanpith awardee Rehman Rahi was awarded Padma Shri in 2000 while Amin Kamil was selected in 2005 for the award in literature and education. Former Vice-Chancellor of Jammu University Amitabh Matoo and former Secretary of the J&K Academy of Arts and Languages M Y Teng were conferred with Padma Shri in 2008 while Hashmatullah Khan was the lone awardee awarded in the field of arts last year. Former Chief Minister Ghulam Mohammad Sadiq was the first recipient of Padma Vibhushan from Jammu and Kashmir. Sadiq got the prestigious award in 1972. Former Chief Justice of India Adarsh Sen Anand and eminent bureaucrat P N Dhar, who trace their roots to the state were amongst the Padma Vibhushan recipients in 2008. Educationist Syed Asaf Ali Ashgar Fyazee was the first state subject to receive Padma Bhushan in 1962 whereas Lt-Gen T N Raina was decorated in 1972 for civil services and Balraj Puri in the category of literature and education, in 2005. Veteran Gujjar leader Mian Bashir Ahmad got Padma Bhushan in the category of public affairs in 2008. Kala zeera is native to Europe and Western Asia but is widely distributed in dry- temperate regions of northern hemisphere and the species is widely cultivated in many parts of the temperate zones like Holland, Russia, Hungary, Poland, Denmark, Germany, Norway and lately also in the US. It is extensively found at an altitude between 2000and 3000 metres in the western Himalayan region, extending up to Baluchistan and Afghanistan and known the world over by different vernacular names. High-altitude regions of Kinnaur, Lahaul-Spiti, Pangi and Bharmour in Himachal Pradesh and the Padder valley and the Gurez area of Jammu and Kashmir are the potential areas for its production in the Indian subcontinent. Scientists from agroforestry division of SKUAST, viz, Dr SK Gupta, M Saleem, Sandeep Sehgal and NS Raina maintained that cultivation of Kala zeera is quite remunerative as one hectare of the crop yields a net return of Rs 13, 680 to Rs 1,05,277 between the fourth to tenth year of its establishment. Regarding its utility, they said its seeds were stimulants and carminatives found useful in curing of diarrhoea, dyspepsia, fever, flatulence, stomachache, hemorrhoids, amnesia, boils and obstinate hiccups. 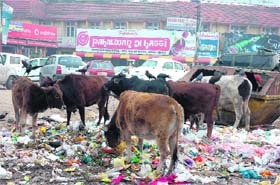 "Till date negligible amount of production was reported only by collection from the forest/grazing areas in the dry temperate localities of Jammu and Kashmir," they said. The seeds were harvested only during June-July from the wild populations from the forests or grazing lands by migratory people in the Paddar valley. 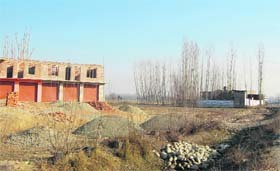 But with the commissioning of the horticulture technology mini-mission project in the state, one project was sanctioned in the division of agroforestry, SKUAST-Jammu, and efforts were made to promote its cultivation in the Paddar valley on scientific lines and as a cultivated crop, said Dr SK Gupta. Under this project, training was imparted to farmers by the university resource persons on various aspects of its cultivation. Demonstration plots with selected farmers were also laid in different villages of the Paddar valley such as Atholi, Tatapani, Hanswar, Karthai, Kundal etc. in order to evaluate the performance and its potential in the area, he added. The farmers were trained to adopt standard practices so that a good crop could be harvested with an optimum yield. However, during a survey of its potential natural zone and continuous interaction with farmers of the Paddar valley, some of the bottlenecks for low productivity of this cash crop were identified. The bottlenecks were non-availability of promising and high-yielding cultivars suited to specific site conditions; low seed germination because of immature harvesting coupled with long wait of years for the crop from seed; lack of scientific and improved agro-techniques; disease and pest incidence like tuber rot, leaf and umbel blight. Dr Gupta maintained that by providing superior seed/planting material to the farmers the cultivation of this cash crop will not only improve the economy of tribal people but also save the species from extinction. The market price is variable and ranges between Rs 200 and Rs 600 per kg. "It is really sad that people continue to violate the law by smoking openly without caring about the health of others," said Rajinder Kotwal, a resident of Gandhi Nagar here. Several health hazards are caused due to passive smoking. Even as the authorities say that they have taken stringent measures to check smoking, people can be seen openly violating the ban. "We have penalised a large number of people for smoking in the open and we continue to do so as per the provisions of the anti-smoking laws," said a senior police officer. Local residents say that even the police is not fully aware about the quantum of penalty to be imposed on the smoking ban violators. Adding to the problems of common people is the fact that most hotels and restaurants here have not made separate smoking zones , compelling people to smoke in the open. The number of knots per square inch, color scheme and weft lines, all are in “taleem” which is chanted by the master craftsman, who has memorised many patterns over the years. The designs are created on a graph paper, then translated and converted into a script known as “taleem”. “One cannot weave carpet alone. I assist my husband in carpet weaving. Besides, there are three more persons working with my husband,” says Zaina Akther, while working on a carpet loom in a room adjacent to their house. Zaina, a resident of Ganasthan in Bandipora district, says, “Three or four weavers work on a loom at a time depending on the width of the carpet. The coordination of weavers and other skills are necessary for uniform weaving. The master craftsman reads the ‘taleem’ and others follow it”. “Taleem” is must for carpet weaving. “I learnt it during my childhood. But now my husband reads it out and I follow him on designs and patterns”. Zaina informs that weavers must have a good command and knowledge of mathematics and language to design and weave skillfully. Classical designs such as Kashhan, Kirman, Ardebile, Isfahan, Joshgan, Shalimar, Shaheen and Guldan are reproduced apart from distinct designs based on flora and fauna of Kashmir. Zaina, mother of eight daughters, says she wishes to provide proper education to her daughters, but at the same time, feels that they should learn skills as well. Unlike many others, Zaina’s husband has not left weaving carpets. He wants to continue with the legacy. “Though I too could find other profitable work to do but somehow I feel emotionally attached to it. The art has been handed over to us since generations. We should not give it up and try to make it unique and innovative,” he says. The loom used in Kashmir carpet weaving is composed of two horizontal wooden beams between which warp threads are stretched. Zaina’s neighbour, Naza Bano finds carpet weaving easier and profitable. She too has been associated with it since her childhood. “Carpet weaving is time consuming, but it is profitable compared to other handicraft related works”. Her views are echoed by 39-year-old Arshida Bano. “More money can be earned by weaving a carpet. Almost every woman in this area is well-versed with carpet weaving. However, the younger generation is not much interested”. She adds that she gets her share from the family once a carpet is ready. The corporation has constructed eight fountains at various localities across the city and architecture of the fountains presents a heritage view of the city to attract tourists in the state. “We have identified eight different locations across the city where these fountains have been set up. Some of them have already been inaugurated and some would be inaugurated in upcoming days,” said Manzoor Ahmed Taray, officer on duty at the SMC. He said apart from making the city beautiful, the fountains have been constructed keeping in view the marvellous Kashmiri architecture and traditional stonework. He said the concept of the construction of these fountains was conceived long ago with the aim to beautify the city so as to attract tourists and provide them a place where they could enjoy. The residents of these localities where these fountains have been constructed praise the SMC as they say that with the construction of these fountains they could spend sometime around them in solace. 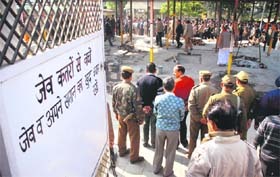 “The city is fast becoming a concrete jungle and everyday increased traffic is adding to the miseries of common people. These fountains will provide some solace to the eyes of the people as they resemble the traditional architecture of Kashmir,” said Irfan Ahmed, a resident of Karan Nagar where one such fountain has been constructed. “It is good that the SMC has taken the step to beautify the city, but it should have taken care of pedestrians as when the water comes out of the fountains, it spills on roads thus making it difficult for people to walk,” said Manzoor Ahmed, a passer-by in Karan Nagar. However, the municipal authorities believe that the fountains would help attract more tourists to the valley. “We are fast losing our natural resources for which the valley was famous for, but this is a small step by the corporation to make people aware that tourism in the valley is the backbone of the state economy and people should not only preserve the cultural heritage, but also natural resources,” Taray added. Nazir Ahmad Dar, president of the Kashmir Chamber of Commerce and Industry (KCCI), alleges that despite the sanctioning of the depot by the Central government, the same is awaiting implementation. “Five years ago, the KCCI took up the matter with the Central government, following which Rs 8 crore were sanctioned to SIDCO for the purpose. Unfortunately, it has yet to come up,” he says. Alleging indifferent attitude of the government, Dar observes that the same, if established, would boost the handicraft sector. He informs that a depot was set up in Jammu three years ago, but the valley has been left out. Raouf Ahmad, one of the leading exporters dealing with handicrafts, says heavy items like namdhas, wood carving and chain stitching are sent through trans-shipment. He argues that exporters face immense problems as they have to load, unload and reload their goods before it actually reaches the final destination. Another exporter, Shabir Hussain shares that export items that go in bulk and cannot be sent by air are sent from Srinagar to Delhi and then to Mumbai and onwards. “The goods are sent in trucks from Srinagar to Delhi and then in containers to Mumbai. After custom clearance in Delhi, containers are sealed and sent to Mumbai for shipping,” he says, adding that the same involves additional cost and time. Abdul Hamid Punjabi, senior vice-president, KCCI, says sometimes vessels are not available in time in Mumbai and at times, containers are not available in Delhi, which creates problems. He observes that containers are required to send goods to other countries, particularly the US, but at times, even reserve containers are not available. According to him, depot should have been one of the first priorities of the government. The depot, he says would help in storing imported goods like timber and electronics and would benefit traders. Punjabi complains, “Improper handling results in breakages and losses. Repacking is the biggest problem. Handling agent takes care but we wish to monitor it ourselves”. Despite being the lone surface link between Jammu and Srinagar, the road was full of bumps leading to accidents every year. However, officials of the BRO have now taken the responsibility to revamp the 5-km-long stretch to lessen the inconvenience to the commuters. This correspondent found that about 12 labourers and engineers of the BRO were revamping the stretch. “As per the norms, we recommend a truck to ply with 40-tonne load, but to no avail,” UN Singh added. The paintings had turned gloomy over the period of time and the “heritage point” was crying for attention. After the two civic bodies: Jammu Municipal Corporation (JMC) and Jammu Development Authority (JDA) kept their horns locked over accepting the “responsibility for looking after the heritage point”, finally, the latter has embarked upon the project aimed at reviving the lost glory of the site. The JDA has engaged as many as five artists to draw the pictures reflecting the cultural diversity of the state. The road is a thoroughfare as all busses entering the city travel through this highway. On both sides of the road, painters can be seen these days drawing portraits of various occasions of importance of all cultures on huge embankments. The subject of these paintings have been centered around the spectrum of activities ranging from festivals to the lush green pastures, landscapes, rolling hills to the lakes of Kashmir. Nomadic culture is also an attraction of the project. The paintings also highlight several rites associated with Dora festivals like Lohri and Karva Chauth. “We have to make efforts to smooth the surface of embankments. In the absence of proper care, wild vegetation had grown over the paintings, said a artist, Amit Anand and added, “If the authorities concerned ensure proper care, the paintings can last for nearly 5 years”. But the locals have been sore over the project as they believe that the spirit of the Dogra culture was not highlighted properly. “Look at the painting, one can easily identify the Gujjars and Kashmiris. But the Dogra attires and their cultural identity is not being portrayed in the right perspective, said a group of youth near Government College for Women, Gandhi Nagar. However, its irony is that the heritage site still resembles sore commercial place demarcated for advertisement purpose. Huge hoardings with pasted advertisements on the long stretch cover more space on the embankments than the paintings. Similarly, graffiti reading commercial advertisements at certain places make the grandeur of the “Heritage Point” clouded. Criminals have principles, so it is said. But this doesn’t seem to be true anymore. One class of these anti-social persons-the pickpockets-have spread the menace everywhere. Be it temples, hospitals, bazaars, railway stations or bus stands, pickpockets are all around us. But the most shocking is their activity in cremation grounds also. Pick-pocketing complaints have become so common at these places that big warning messages have been painted on walls. One such ground in Shastri Nagar has even painted the warning (See picture) on the entry gate. Hopefully, the pickpockets would leave at least such places on their own as the cops seem helpless in the matter. Apparel shops that were seen empty most of the time this season have started attracting a huge number of shoppers because of their huge discounts and “loot schemes”. It has become a difficult task to enter these shops, crowded as they are like any movie hall. Branded garments like Monte Carlo, Blue Mount, Wills, Nike, Reebok, Puma, Adidas and etc are all offering discounts. Shoppers having a gala time and handful of carry bags can be witnessed at Gandhi Nagar, Residency Road and other places in the city. Not alone the shoppers, shop-owners are also happy to clear their old stock and second-quality products too during such “loot schemes”. Customers must exercise caution while going for such discount sales. The recent news of lifting of ban on the pre-paid mobile connections has made smile return on the faces of school and college students, who were feeling lost due to the imposition of the ban a few months ago. After the enforcement of the ban, a majority of the students could not afford post-paid connectionss, which resulted into a huge loss of customers for various telecom companies. The students were also feeling suffocated due to the ban imposed on their main/ important medium of communication. The installation of traffic lights at every heavy traffic point can help a lot to get rid of frequent traffic jams in Jammu. Despite serious efforts by the traffic police, traffic jams are the order of the day, inconveniencing people everyday. The problem gets worse during morning and evening hours. VIP movement adds to the problem. No proper use of bus stops by mini-bus drivers further intensifies traffic congestion in the city. Qazigund is the first town on the highway where the 300 km-long highway opens into the Kashmir valley after crossing the Jawahar Tunnel. The foundation stone of the project was laid by Mufti Mohammad Sayeed on July 17, 2005. It comprises of tourist information centre, restaurant, shopping centre, parking, public conveniences, amphitheatre, water bodies and landscaped area. The pace of work on the project, that was expected to be completed in one year, however, has been slow and is expected to be completed during the next couple of months. The Rs 3.65 project, for which the Centre had allocated Rs 1.65 crore, spread over an area of 42 kanal has all constructions completed, while only groundwork like landscaping is being done. It has space constructed for a tea bar, photo gallery, shopping complex with five shops, yatri niwas, youth hostel, reservation counters, dormitory, medical centre and hutments.